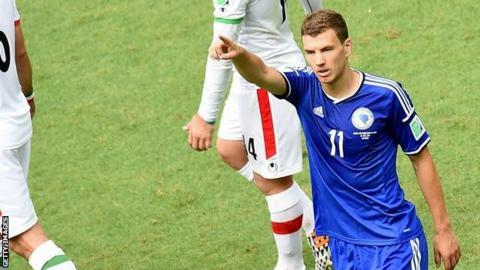 Bosnia-Herzegovina expect striker Edin Dzeko to be fit to face Wales in Saturday's Euro 2016 qualifier. Dzeko, 29, was initially ruled out for four weeks after twisting his knee in Roma's 5-1 over Carpi on 27 September. But Bosnia assistant coach Dragan Peric said: "We hope Dzeko will be ready. "He was due a check-up in Rome on Tuesday which included training with the ball and as far as we know, he will be at the staff's disposal for the Wales match." The former Manchester City player, who is expected to join up with the national squad on Wednesday, has scored seven of Bosnia's 12 goals in the qualifying campaign. They are currently fourth in Group B, battling against Israel and Cyprus to clinch a play-off place by finishing in third place. The home side will be without suspended Everton midfielder Muhamed Besic for Saturday and the following trip to Cyprus on Tuesday in the group's final game. Besic was sent off in September's 3-0 win over Andorra. Chelsea goalkeeper Asmir Begovic has been included in Mehmed Badarevi's squad. A draw for Wales against Bosnia in Zenica would see Chris Coleman's side qualify for the Euro 2016 finals in France.